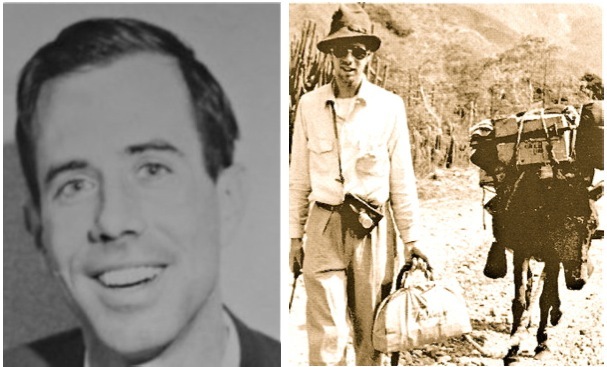 Jim Moseley’s early flying saucer days were interrupted by frequent visits to Peru for treasure hunting, or vice versa. 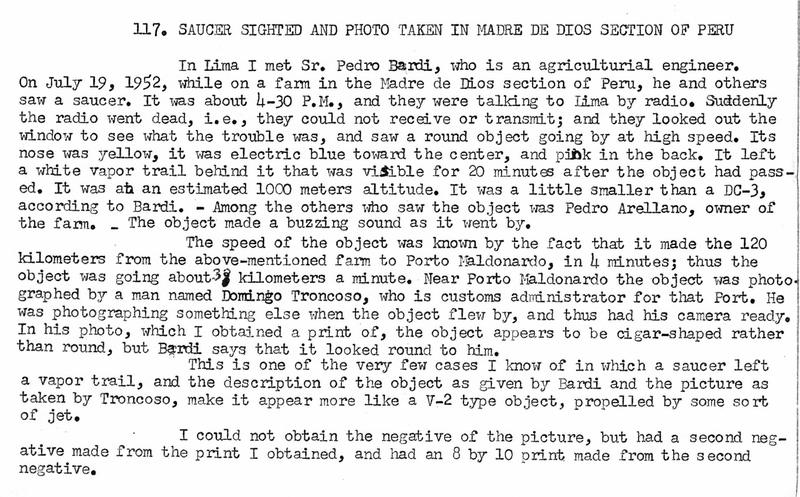 During a trip there in May 1954, Jim met a man, Pedro Bardi Zeña, who had a dramatic story and a unique photograph of a flying saucer. 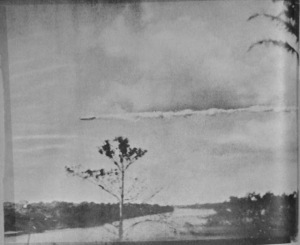 Bardi told him of a UFO that left a distinctive trail of vapor or smoke as it streaked across the jungle sky. Jim Moseley’s original file, from an unpublished manuscript. 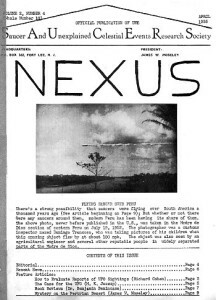 The story and photo was first published in the US in the April 1955 issue of Saucer News (then known as Nexus). 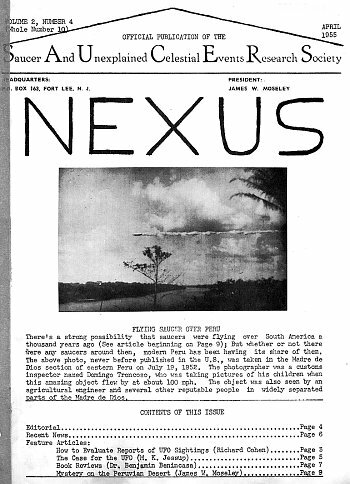 NEXUS, later retitled Saucer News. NICAP believes members may be interested in the accompanying picture supposed to have been made of a smoke-trailing object over Peru in 1952. 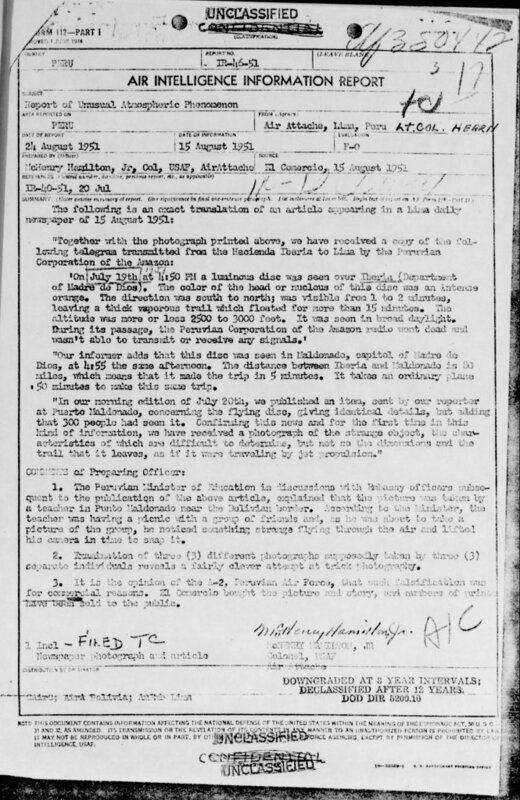 The photograph and extracts from the sighting report are reproduced with the kind permission of James Moseley, editor of SAUCER NEWS. “In Lima I met Señor Pedro Bardi, who is an agricultural engineer. 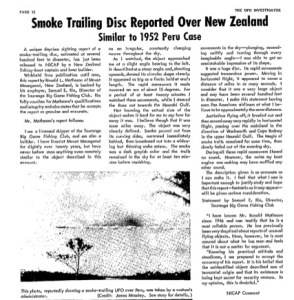 On July 19, 1952, while on a farm in the Madre de Dios section of Peru, he and others saw a saucer. It was about 4:30 p.m. and they were talking to Lima by radio. The object’s speed, Moseley explains, was determined by a report that it was seen four minutes later near Porto Maldonado, 120 kilometers distant. This speed was computed at 1117 miles per hour. The photograph was secured from a customs administrator named Domlngo Troncosco, who said he had taken it as the object flew near the port. 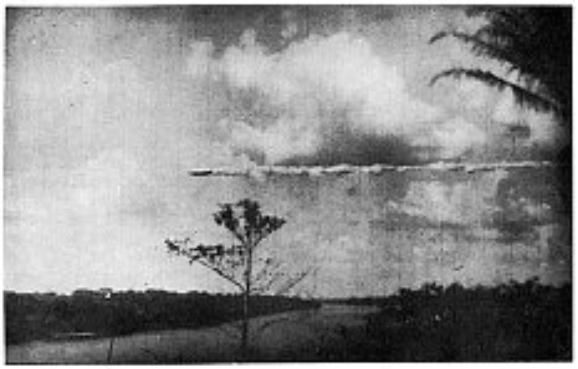 Though the photo shows a cigar-shaped object instead of the round shape Bardi described, this could possibly have been due to an elongated effect caused by speed. What Jim and NICAP did not know, was that Project Blue Book already had a file on this case. Jim accurately repeated information given to him, but some details he had were inaccurate. There was a newspaper story on it, and even some degree of official investigation. That’s very interesting for several reasons, but chiefly for the mention of additional photos, which have not been seen since. Report by Col. McHenry Hamilton, Jr. See link below for full file. Did Jim get conned? 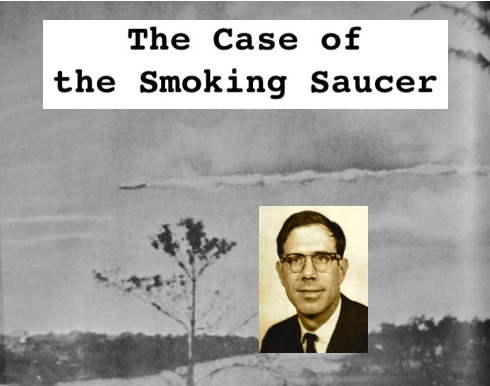 Bardi had heard of Jim’s interest in flying saucers, which is the reason he sought him out and brought the story and photograph to him. Jim was given no reason to doubt Bard, the picture, or the details of the story. He went on to present the material just as he’d received it, and few have ever given serious question to the authenticity of the photo itself. 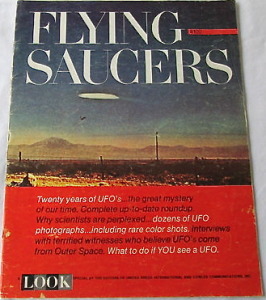 The biggest exposure the photo received was in the Flying Saucers Look Magazine Special, 1967. 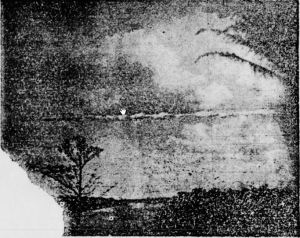 The full page photo appeared with only a brief caption in tiny print, where it credits Saucer News for the picture. This magazine was a mainstream publication that reached millions of readers. The picture has continued to receive exposure world-wide, frequently reprinted, often without attribution, and in a cropped form. It’s been seen in countless UFO books, publications, websites and documentaries. It was this “angel hair” article that prompted Jim to ask me if I could track down additional information on the photo. The report I prepared for him ultimately became the foundation for this article. This picture seems to have reached the American public via James Moseley. That fact is almost enough to make you quit bothering right there. Moseley, however, nice a guy he may or may not be, has spent a life fouling the waters of UFOlogy with hoaxes, misrepresentations, rumors, misplaced “humor” … it has been an almost wholly unhelpful “career” to the field. Apparently, Swords’ prejudice against Jim prevented him from making any attempt to contact Jim to find out more about the photo. Jim considered responding to Swords’ sore-headed misrepresentations and rumors, but decided to quit bothering right there. “My picture,” is what Jim called the Peru saucer photograph, and he was proud to have introduced it to flying saucer study. He always thought the photo was genuine, but that it was likely just pictured an aircraft of earthly origin. I think Jim would have been happy to know that there’s still interest in the photo, and that more information on it is coming to light. Special thanks to Vicente-Juan Ballester Olmos for the information on which this list is based. 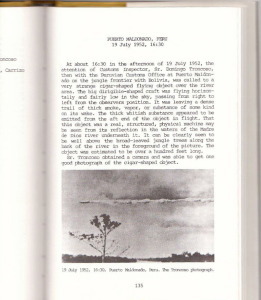 Wendelle Stevens & August Roberts, UFO Photographs Around the World, Vol 2, 1985, p 135. El Comercio (Lima), August 15, 1951. Nexus, April 1955, cover. (Saucer News,) 1st US publication, includes Moseley’s desc. The UFO Investigator, Vol I, No 2, August-September 1957, pp 12-13, quoting James Moseley letter to NICAP, August 10, 1957. Jimmy Guieu, Black out sur les soucoupes volantes, Fleuve Noir, 1956, plate 10. Richard Hall, The UFO Evidence, NICAP, 1964, p 88. Recap of NICAP article- brief listing. Epoca (Milano), September 4, 1966, pp 32-33. Flying Saucers Look Magazine Special, 1967. Photo only, no details, credits Saucer News. 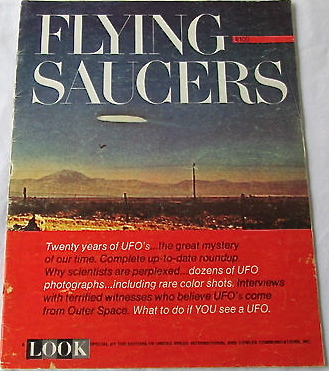 Max B. Miller (ed), Flying Saucers Pictorial, Arizill, 1967, p 55. L. Kettlecamp, Investigating UFOs, Ronald Stacy, 1972, p 49. 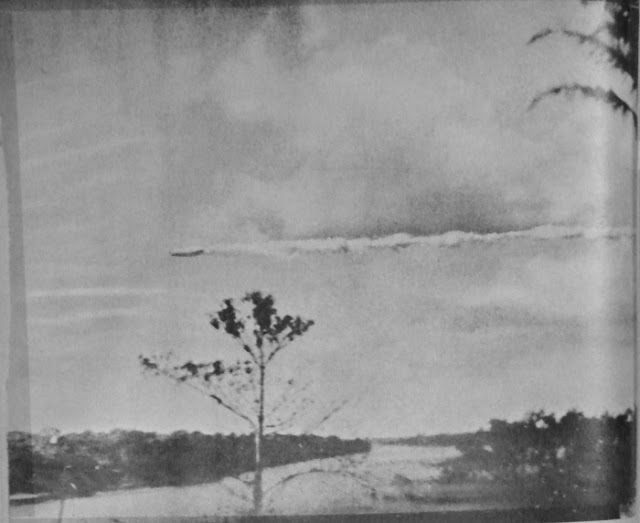 Guillermo Roncoroni & Gustavo Alvarez, Los OVNI y la evidencia fotográfica, Cielosur, 1978, p 207. Loren Gross, UFOs: A History. 1951, 1983, p 35; and UFOs: A History. 1952 June-July 20th. Supplemental Notes, 2001, pp 54-55. Giuseppe Stilo, Ultimatum alla Terra, UPIAR, 2002, pp 487-488, quoting Gazetta di Parma, July 6, 1952. Michael Hesemann, UFOs. Besucher aus dem Weltall, Könemann, 2001, p 45. James Moseley & Karl T. Pflock, Shockingly Close to the Truth!, Prometheus, 2002, pp 140-142. Michael Swords, Can we learn anything from UFO Photos? Previous PostThe James W. Moseley (Dreaded) Internet Roast (Archive)Next PostThe 2015 CSU/NUFOC Reunion is Coming!